The interview was a promotional interview for his movie Mr. Idol so of course he was asked about it. Ji Hyun Woo did not initially want to do Mr. Idol because he thought it was a predictable story. But he finally decided to take on the role as the idol group leader, Eugene, because he wanted to work with the young director of the movie, Rah Hee Chan. Ji Hyun Woo had always wanted to work with a young director so that they can converse and collaborate on a project together more freely than he could with an older director. Starting with the 2004 KBS sitcom, Old Miss Diary, Ji Hyun Woo has consistently been cast as the “younger male” counterpart in the older female-younger male romance stories. Regarding this image Ji Hyun Woo revealed that he did not mind it at all; rather, he saw it as an opportunity to work with more experienced actors whom he can learn from. The reporter who did this interview described Ji Hyun Woo as a positive thinker who seemed more suitable to the analog age rather than the digital age. 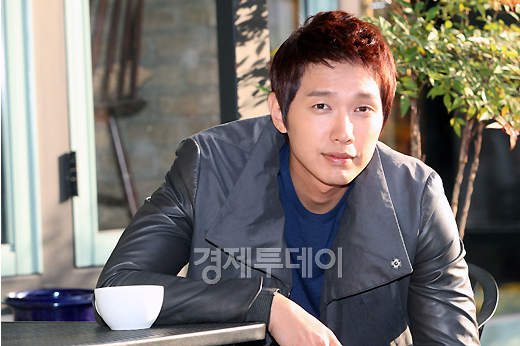 A lot of people seem to describe as Ji Hyun Woo as someone who is very mature and acts older than his age. I suppose that has something to do with his upbringing and working with older actors at a young and impressionable age. I think Ji Hyun Woo has a good head on his shoulders and doesn’t take his profession as an actor too seriously. Not to say that he doesn’t care about it; I think what he meant about acting being his way to make a living was that he is content to be an actor rather than a celebrity. P.S. really liked the photos! I think he makes a really good “Oppa” type of figure. No wonder the noona’s like him. So.. Oppa, I think you are ready to get married with YIN Unnie. I really envy with YIN unnie to have a good man like JHW oppa. Surely Hyun Woo is a conservative type of guy. I like that. This is one staple reason for me to follow celebrities like him, when acting is not for celebrity or fame but more of enhancing their craft. Again, Thanks Joonni !! OMO… I can’t believe you agreed to translate this interview! Thank you so much Joonni! You’re the best! :)) I used to Google translator before you translate this article and Coldplay and Damien Rice were mentioned. Did he talked about them in that interview? 🙂 Thank you! Oh… please, don’t ever say sorry 😀 You don’t even know how much you make JHW’s fans happy… we’re really so grateful! I asked about it because I just talked about it few days ago with tessieroo that he’d totally nail Damien Rice’s songs without knowing he listened to DR’s songs 😀 JHW seems to like British artists a lot. Radiohead, Coldplay, Damien Rice, …. Once was pretty huge here since the main actress(musician) Marketa Irglova comes from where I live… the Czechs were pretty proud of her when they won Oscar. I’ve heard good things about the movie and I absolutely love the lyrics to “Falling Slowly.” Heartbreakingly poetic. So you live in Czech? Cool. I have always liked the idea of analog vs digital as a metaphor for personality. Also, accoustic versus electric instruments. He said in that other interview that music is his love and acting is his job. The analog vs digital is really a good metaphor. Although I think there is a lot of gray area in the comparison because it is a relative comparison not an absolute. You just give me more reasons to like this man. Thanks for this story! Oh man, Joonni, I don’t know how it’s possible but you’ve made me fall even deeper in love with him. …of course, I shall concede to YIN (you lucky girl). Thank you for all your articles on JHW. I became his fan after watching ATK, though I didn’t complete the drama. I just couldn’t watch it anymore after ep 28, I stop completely. I stumbled on your website while I was browsing for an updates on QIHM recaps when the drama was aired on tvN. I enjoyed reading your recap of QIHM so much. You are meticulous and super fast with the recaps, and I enjoyed your humor. It shows in your writing. This is my first time commenting on a blog, though I have read a lots of them but never bother to leave any comment. I decided to drop a comment to let you know how much I have enjoyed reading all your articles. Love love all your creative works!! Thanks for commenting! I stop watching ATK midway too.